The SHSTC All Girl Orchestra (1943-'46): will hold its first reunion during SHSU's '98 Homecoming. On Oct. 29 the group will gather for lunch on campus followed by a memorial service. The reunion concludes with a gala dinner featuring live music reminiscent of the Big Band Era. For details, contact Maggie (Farris) Parker ('48) at (713) 465-6006. Parade, Sam Jam Pep Rally & Fireworks Display: SHSU's 1998 Haunted Homecoming festivities kick off with a parade down Avenue H to the intramural field by Bowers Stadium where revelers will gather for a giant "Sam Jam" pep rally in preparation for the Halloween day grid-iron battle against the McNeese State Cowboys. The festivities culminate when the heavens light up with an impressive pyrotechnic display. For the latest information on the "Sam Jam" rally, call SHSU student activities at (409) 294-3861. Golden Circle Reunion: Registration and lunch for the 1998 Golden Circle Reunion begins at 11 a.m. in Lowman Student Center Ballroom. This year, the SHSU Class of 1948 celebrates its 50th anniversary. The luncheon is open to all SHSU alumni from the Class of 1948, their friends, family and members of previous classes who have already been inducted or are eligible for membership into the Golden Circle Club. Tickets are $15. Journalism Recognition Reception: Former SHSU "J" school students reunite at a special evening in the Sam Houston Room at the Sam Houston Inn, beginning at 5:30 p.m. For details, call the journalism office at (409) 294-3695. 1998 Distinguished Alumni Dinner: A silent auction and reception kicks off the annual dinner honoring distinguished SHSU alumni in the Lowman Ballroom. Dinner is slated for 7:30 p.m. The 1998 honorees are: David Adickes ('48), Tommy R. Austin ('75), Karey P. Bresenhan ('62)' and Claude W. Reinke ('65). Tickets are $30. 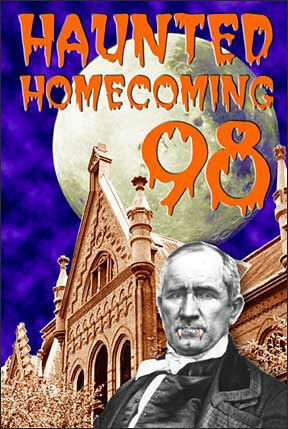 Alumni Coffee & Homecoming Registration: SHSU exes are urged to begin their Halloween homecoming with a continental breakfast at Austin Hall. While there, they catch up on the latest SHSU news while visiting with university administrators, faculty, and fellow alumni. Alpha Chi Omega sorority is planning a special homecoming weekend event. The details will be in the mail soon, but the curious are invited to call the Alpha Chi Omega House at (409) 294-3109. BSU Open House: The Baptist Student Union will open its doors to former students. For more information contact Don Coleman ('58) at (409) 295-2962. The SHSU Lettermen Association will hold its annual meeting in room 303 of the Lowman Student Center. Family and Consumer Sciences will hold a homecoming coffee in the Mattie Bea Medford Living Center located in Academic Building II. For details, contact Phyllis Kennedy at (409) 294-1242. Agriculture Alumni will gather for a reception and coffee in room 325 of the Thomason Building. Black Alumni Reception: The SHSU Program Council's Black History Committee is sponsoring a special event for black alumni at the Lowman Student Center. For details, contact the Department of Student Activities at (409) 294-3861. KSHU Celebrates 25th Year: Throughout October, SHSU's campus radio station will be celebrating its 25th anniversary with a number of special broadcasts. Alumni are invited to stop by for brunch and tour the facilities in the Dan Rather Communications Building. Tune in after the game for the final anniversary broadcast. For details, call Craig Stark at (409) 294-1347. The College of Arts & Sciences is planning a Distinguished Alumni Brunch. For details, Carol Smith at (409) 294-1326. Delta Tau Delta Fraternity will dedicate the Joe M. McKenzie Delta Tau Delta House and host a pre-game barbecue luncheon. For more information contact Will Douglas at (409) 291-8339 or Fred McDaniel at (409) 436-1935. SHSU Lettermen Association Hall of Honor Luncheon with be held in the Lowman Student Center Ballroom. This year's honorees are former lettermen: John Scheer ('60), Gerald Walling ('61), Jimmy Dodd ('65), and Steve Shaver ('62).Tickets are $20 and may be purchased with the registration form on the facing page. The Political Science Homecoming Luncheon is slated for the Lowman Student Center's Huntsville Room. Tickets are $25. For more information contact Edwin Davis at (409) 294-1462 or e-mail him at pol_esd@shsu.edu. The Military Science Department will hold an alumni reunion social as part of the Bowers Stadium tailgate party. For details call Peggy Kindt at (409) 294-1298 or (409) 294-306. Tailgate Party: A campus-wide tailgate party will be held in the Bowers Stadium parking lot. Alumni are encouraged to bring their families and join the many SHSU organizations gathering for pre-game fun and food. Sponsoring organizations include: the SHSU Alumni Association, the SHSU Department of Student Activities, the College of Business Administration, the College of Criminal Justice, the College of Education and Applied Sciences, the Residence Hall Association, the Department of Athletics, the Student Government Association and the Bearkat Marching Band. College of Business Mixer: COBA alumni are invited to gather at the Bowers Fieldhouse Lounge. Gametime! : The mighty SHSU Bearkats mix it up with the McNeese State Cowboys for the annual homecoming football game at Bowers Stadium. Tickets may be purchased in advance. For details see the registration form on the facing page. An Ice Cold Block Party sponsored by Alpha Phi Alpha is slated for the University Club Apartments. The Sigma Chi Alumni & Parent Barbecue fires up at the Sigma Chi House on Hwy 980. Call (409) 294-1432 for details. The Sigma Tau Gamma Alumni & Parent Barbecue takes off at the Sigma Tau Gamma House located off Hwy 19 on Echo Lane. Call (409) 436-9247 for details. Biology Barbecue: The SHSU Department of Biology and Environmental Science will hold its annual homecoming barbecue at faculty member J.D. Long's home located on 3352 Winter Way. Halloween Costume Contest: The Zeta Phi Beta Sorority is holding a Halloween costume contest at West Hill Mall. Prizes will be awarded in various age groups. LadyKat Volleyball: In the other homecoming game, the SHSU LadyKat netters face Lamar in the Johnson Coliseum. Alpha Phi Alpha Fraternity presents "The Bomb" A long standing Alpha tradition at Sam Houston. For details, contact the Department of Student Activities at (409) 294-3861.